His planter practically begs for an Agave, don't you think? Weather Diary, Oct 2: Hi 71, Low 54/ Precip .02"
That is the perfect spot for an Agave. That face is exactly the face Nigel makes when he carries my Agaves into the greenhouse for the winter. It's the 'Don't poke me" face. Nigel's problem is excerbated by his lack of depth perception. I'll take it, if you're still looking for someone to give it away to. I'll get it to you! Glad it has a good home waiting, it's special. I think the rest of the crowd will show up here and there in other people's gardens but this guy seems like a keeper. He looks perfect holding an agave! Does this mean he gets to stay in your garden? You're STILL finding gnomes? How many did you find, in total? And, I love that you gave him an agave to carry - LOL! This one makes nine, and I honestly don't think I would have found him yet if not for a hint from Alan. The agave works if there is drainage. 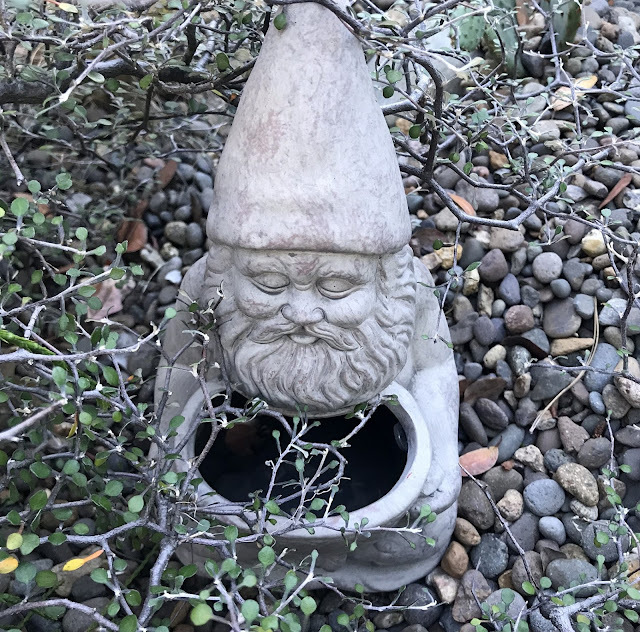 A plant "spilling" out of it will work too if the gnome is standing higher then ground level. I thought he was begging for money ! lol ! ..yes an Agave looks just perfect ! Oh my gosh, you're probably right! He looks pretty happy with the agave! So does he get to stay? He's a cutie! Are you going to keep him? He looks pretty comfortable with that agave. 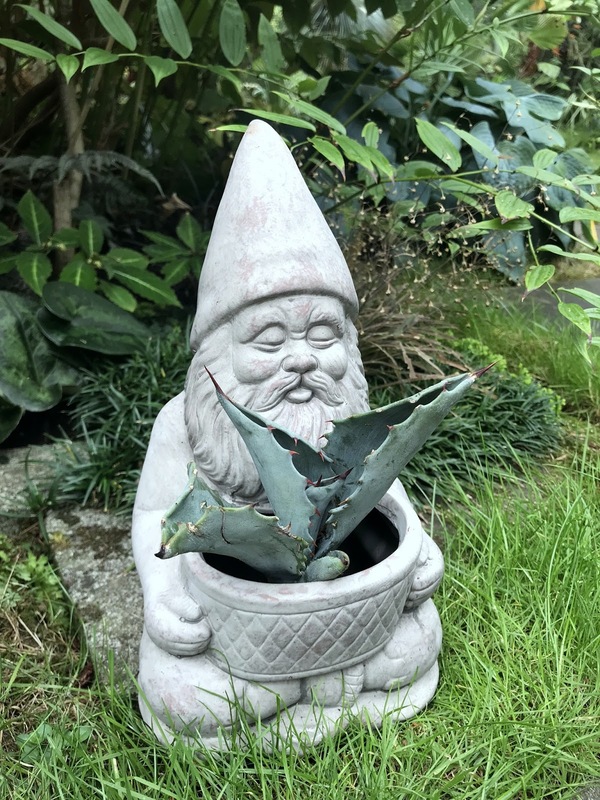 He may get to keep the Agave, but I won't be keeping the gnome. He looks pleased to have such a neat agave in his planter. I would have trouble letting these guys stay in my garden even for a night. You are a garden saint. You need to keep this one! Being made of stone is sure an advantage for toting Agaves. I'd hire him.